2. Preheat oven to 350 degrees F. On lightly floured surface, with floured rolling pin, roll one-third of dough at a time 1/8 inch thick, keeping remaining dough refrigerated. With floured 3 or 4 inch heart-shaped cookie cutter, cut dough into as many hearts as possible. Place hearts, 1/2 inch apart, on ungreased large cookie sheet. Reserve trimmings. With floured 1 1/2-inch heart-shaped cookie cutter, cut out centers from half of stars. Remove cutout centers, and bake along with larger cookies, checking after 7 minutes for doneness. 3. Bake cookies 10 to 12 minutes until lightly browned. With pancake turner, remove cookies to wire racks to cool. Roll remaining dough and trimmings together to make more cookies; bake. 4. When cookies are cool, sprinkle cookies with cutout centers with confectioners' sugar. Spread each cookie without cutout center with 1 rounded teaspoon raspberry preserves; top each with a cookie with a cutout center, gently pressing cookies together to form a sandwich. Store in tightly covered container. To make open face jam covered cookies, place one teaspoon raspberry jam on solid heart cookie and with a small paint brush or spatula pull jam out to cover entire top. 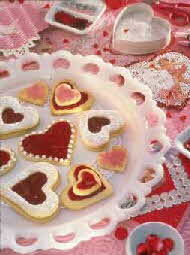 Outline with purchased cookie decorations, or top with small cutout heart and decorate with sugar sprinkles or more jam. Each sandwich cookie: About 190 calories, 2 g protein, 29 g carbohydrate, 8 g total fat (5 g saturated), 21 mg cholesterol, 160 mg sodium.